Launch your calling to reach the world! Is God calling you to ministry? Are you looking for a ministry training program that is challenging yet affordable? Are you desiring to stay way from student debt? Are you hoping to study further after your Bachelor degree to get a Master’s degree? See our partner schools. Take free ministry training classes at Christian Leaders Institute (CLI). Pay low fees to have that free training turn into a collegiate credential at Christian Leaders College. Click Here for more details. The opportunities for bi-vocational Christian Leaders are increasing. More and more publications are featuring stories of bi-vocational leaders. Christian Leaders College graduates are using their degrees to do both vocational and bi-vocation ministry. Click here to read stories of Degree graduates. Christian Leaders College serves those called to vocational or bi-vocational ministry. 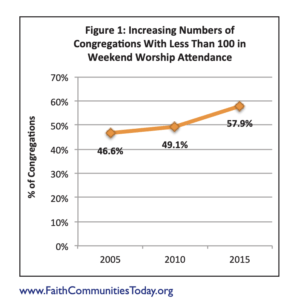 According to David A. Roozen of the Hartford Institute for Religion Research, the average size church in the United States is under 100 people. Churches of this size need well trained bi-vocational ministry leaders. It is optimal that ministry leaders called to serve these churches not have large college debt. Many small congregations are willing and able to support a pastor on a part-time basis. Bi-vocational ministers fit this role perfectly. More trained Christian Leaders are needed. Students enter into the Christian Leaders Ministries family by starting with Christian Leaders Institute. Christian Leaders Institute (CLI) – At CLI, you can enroll in college-level ministry training classes taught by highly educated and rated professors free of charge. You can earn mission credentials with your studies. Christian Leaders Institute is supported by generous vision partners who want to make ministry training available everywhere. All you do is enroll in the Getting Started Orientation Class. Then you receive a scholarship to enroll and complete free classes while studying in the Christian Leaders Ministries family. Christian Leaders College (CLC) – Christian Leaders College is the collegiate credential are of Christian Leaders Ministries. Students take free classes at Christian Leaders Institute. Christian Leaders College is concerned that the standards of collegiate credentials are followed in issuing a credential. Christian Leaders Ministries is seeking to comply with the 22 standards that allow the free courses at CLI and CLC to result in United States Department of Education-recognized accredited certificates, diplomas, and degrees issued at Christian Leaders College. Christian Leaders College is not yet accredited with United States Department of Education recognized accreditation. Therefore, Christian Leaders Institute began a relationship with the Association of Biblical Higher Education. We have applied for Accreditation at this point, and are in the process of complying to the 22 standards of USDE recognized collegiate accreditation. Christian Leaders Alliance (CLA) CLA provides you a local minister ordination option with global recognition. Free studies at CLI, where you earn mission credentials, is all that you need for the ordination process. Your credentials at Christian Leaders College are also welcomed.